Members are entitled to member-priced discounts for the Individual Act Concerts. A highly anticipated event 5 years in the making: Taylor Mac performs all 24-decades from 1776 to the present day in 24-hours. There is no member-priced discount for the 24-Hour Marathon due to the limited number of seats. Taylor Mac’s glittering performance art concerts chart a (highly) subjective history of popular music and activism in America from the nation’s founding in 1776 to the present day. 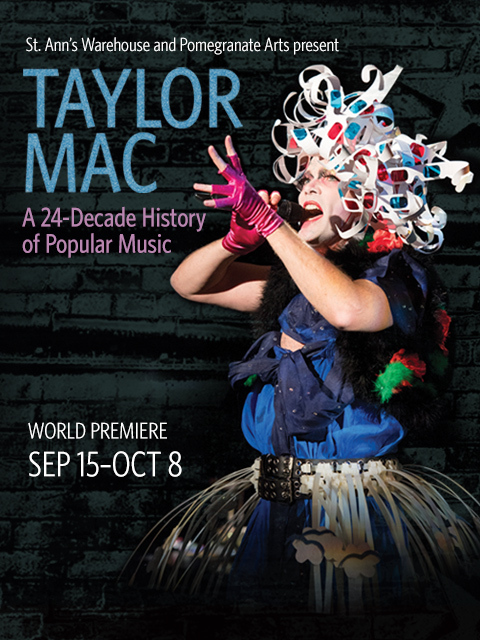 Created with a bevy of collaborators, including music director / arranger Matt Ray, co-director Niegel Smith, 2015 MacArthur Fellow Mimi Lien, lighting designer John Torres, and longtime fellow traveler and costume provocateur Machine Dazzle, this highly anticipated World Premiere will be the first time Taylor Mac performs the complete 24-decade history in its entirety. The American Revolution from the perspective of the Yankee Doodle Dandy and an epic battle between drinking songs and early Temperance songs. Starts with an orchestra of 24. Destined for Broadway, this romp through such chestnuts as “Old Oaken Bucket”, “An Apparition of a Dandy” and that #1 hit, “Poor Little Gypsy” is certain to be a surefire sensation, if not the greatest jukebox musical in the history of mankind. Two men fall in love while escaping slavery; Walt Whitman and Stephen Foster go head to head for title of “Father of the American Song” culminating in the queerest Civil War Reenactment in history. A dinner theater production of The Mikado set on Mars, plus the queerest land grab in history. A Jewish tenement, a WWI trench reenactment and a dance-off between 12 ukulele playing Tiny Tims and 12 Charles Dickens Tiny Tims. Oh the Depression, ain’t it great… Zoot Suit Riots, Japanese Internment Camps, and white people flee the cities. Bayard Rustin’s March on Washington leads to Queer riots; sexual deviance as revolution. Due to popular demand, Act VII will be performed twice. A community builds itself under siege, radical lesbians avenge, and Taylor performs original songs for 2016. Members are entitled to member-priced discounts for the Individual Act Concerts. There is no member-priced discount for the 24-Hour Marathon due to the limited number of seats. A 24-Decade History Of Popular Music at St. Ann’s Warehouse was made possible with funding by Diane L. Max, Andrew J. Martin-Weber, National Endowment for the Arts, New England Foundation for the Arts’ National Theater Project, the Arch and Bruce Brown Foundation, The MAP Fund, a program of Creative Capital, primarily supported by the Doris Duke Charitable Foundation, and The Andrew W. Mellon Foundation. A 24-Decade History Of Popular Music is commissioned in part by Belfast International Arts Festival and 14 – 18 NOW; Carole Shorenstein Hays, The Curran SF; Carolina Performing Arts, at the University of North Carolina at Chapel Hill; Center for the Art of Performance at UCLA; Hancher Auditorium at the University of Iowa; Lincoln Center for the Performing Arts; Melbourne Festival; Museum of Contemporary Art Chicago; International Festival of Arts & Ideas (New Haven); New York Live Arts; OZ Arts Nashville; Stanford Live at Stanford University; University Musical Society of the University of Michigan. This work was developed with the support of the Park Avenue Armory residency program, MASS MoCa (Massachusetts Museum of Contemporary Art), and the 2015 Sundance Institute Theatre Lab at the Sundance Resort with continuing post-lab dramaturgical support through its initiative with the Andrew W. Mellon Foundation. Mac’s musical survey … is offered in the spirit Whitman had in mind when he said that he heard America singing. Taylor Mac seduces you, breaks your heart, patches it back up again and sews sequins along the scars.